EvoStar2019 is the name for the four co-located conferences of EuroGP, EvoApplications, EvoCOP, and EvoMUSART. These co-located events will be held from 24-26 April 2018 in Leipzig, Germany. The friendly and informal atmosphere at EvoStar is intended to foster beneficial friendships and longer-term collaboration across continents and across research generations. Early registrations close on 15 March. Half price student registration are available for MATRICULATED STUDENTS from recognised academic institutions studying for degrees in subjects relevant to bio-inspired computation. You will be asked to supply your student matriculation card and/or confirmation from your director of studies to show you are entitled to the student reduction. Your registration also includes annual membership of the SPECIES Society, the sponsoring organisation for EvoStar promoting evolutionary computation in Europe. There are no obligations associated with membership and SPECIES provides a forum for exchange of information and ideas. 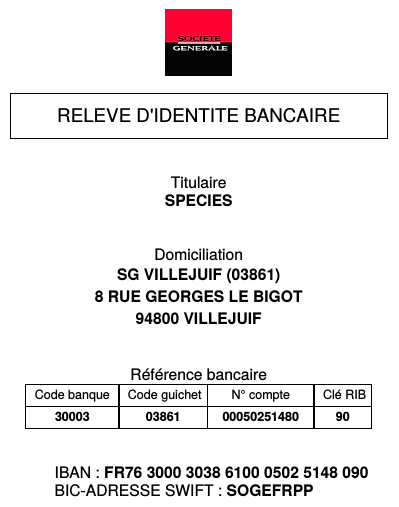 Annual membership of the SPECIES Society, promoting evolutionary computation in Europe. You should first fill the online registration form, then come back here. You can then try to use PayPal and pay by credit card, but please do not insist and lose your time if it doesn't work in the first place: we are experiencing a severe dysfunction (aka a bug!) of Paypal payment, that Paypal finally admitted after several days of fight with their hotline, but still haven't fixed, as of Feb. 14, and you might have to use bank transfer. We apologize for the inconvenience, but, as you understood, there is nothing we can do about this. Whatever your payment method, you will receive a receipt for your registration within 2-3 days. Please contact us in case of any further issue. Additional conference dinner tickets for accompanying persons may be purchased for 50 EUR and are available too. However, for technical reasons, you need to pay the registration and the additional dinner tickets separately. Apologies for the inconvenience. Click on the button below to pay with Paypal. On Paypal page, you can check the details by clicking on the small arrow after the price. Payment should be possible without opening a Paypal account. However, depending the country your credit card is located, you might have to open a Paypal account to be able to proceed with the payment. There is nothing we can do about this, and we apologize for the inconvenience. Because of a severe dysfunction of Paypal payment (aka a bug!) that Paypal finally admitted after several days of fight with their hotline, but still haven't fixed, as of Feb. 14, please use bank transfer (bank information below) if you fail using PayPal. But if you are using this payment method, please clearly indicate the name of the registrant somewhere in the object of the transfer.